Four species in this photo from far left to right: duiker, kudu, warthog and bushbuck, all sharing pellets harmoniously. Although the bushbucks would like to eat pellets, they stay out of the way of this warthog, who happens to be Little who is often quite willing to share with them. By far, this is the least motivated I've felt to get things done since we began our world journey. On six heart medications plus two (non-narcotic) pain medications, many of which slow me down, I am struggling to feel motivated to do the simplest of tasks. Also, I can't comfortably sit at the table on the veranda for any length of time since my legs are still very painful and the chairs are too low for the table, resulting in the necessity of raising my arms to reach my computer's keyboard. With the sternum yet to fully recover raising my arms and holding them in place is challenging even when using a fork to eat at that table. But, each day all of these simple types of movements become a little easier and I'm looking forward to the future. Two more bushbucks in the garden. Looming in my mind right now is entering the countless receipts to be logged onto our spreadsheet, preparing tax information for our accountant in Nevada (most likely we'll file an extension), filing the insurance claim for reimbursement for the angiogram (we're waiting for the insurance company to pay the big claim the end of this month) and of course, our immigration status yet to be resolved. Once we know the big hospital bill is paid by the end of the month, Tom will send the funds we "borrowed from our retirement plan" back to the financial company to ensure we don't have to pay tax on that amount. Also, Tom will continue to research flights and hotels for upcoming travel over the next six months. I've left these tasks entirely up to him to complete. Ms. Bushbuck and duiker getting along well. In the interim, we have two upcoming trips to Nelspruit, one to see the surgeon next Friday and another for an appointment with the cardiologist the following week. There is some type of wire sticking out of my midriff from one of the two drainage tubes placed in this area during surgery. This must be stitches yet to be removed. Hopefully, the surgeon will repair this next Friday. I know its time to get these looming tasks done. I must admit that every chore or task I take on right now takes all the strength and motivation I can muster. I made a low carb coconut cake for my evening snack a few days ago and I thought about it all day until I was finally motivated to put the eight ingredients together and pour them into the pan. Female and male bushbuck snacking together in the garden. with a duiker by the cement pond. I suppose this is to be expected five weeks after surgery especially considering this painful infection in my legs which has set me back a few weeks in my recovery. I can honestly say if I didn't have the infection, I'd be feeling quite good. Although, I imagine the lack of motivation is to be expected at this point. It's funny how I have no trouble doing the daily posts with relative ease and commitment. Taking photos is another matter and I expect once I can walk more easily, I won't hesitate to jump up for any photos ops. Tom does what he can but, as we've noted in the past, his photo taking skills leave something to be desired although from time to time he produces some gems. Tonight, we're going to Jabula. I'm hesitant to go but we both need to get out, and this is the perfect place to do so. We'll mingle with our friends who come and go throughout the evening and will enjoy another great meal, ribs, and rice for Tom and grilled chicken breasts with a big plate of cabbage and spinach for me. Young male bushbuck with budding horns. I'm still not drinking wine and don't plan to do so anytime in the near future. Not only have I lost my taste for it but it makes no sense when I'm taking all these medications. I'm considering totally giving up on alcoholic beverages since I'm not convinced that red wine offers any benefit to heart patients. I didn't drink alcohol for 20 years and it will be easy for me to forgo it in the future. Next Tuesday I'll be able to stop wearing the compression stockings. Without the constant pressure on the incisions from the stockings, I'm expecting my legs to heal more quickly. I've procrastinated enough this morning and now its time for me to do the walking around the house. If my legs didn't hurt this would be easy and I'd be up to an hour by now. But, it is what it is...and I'll do the best I can. 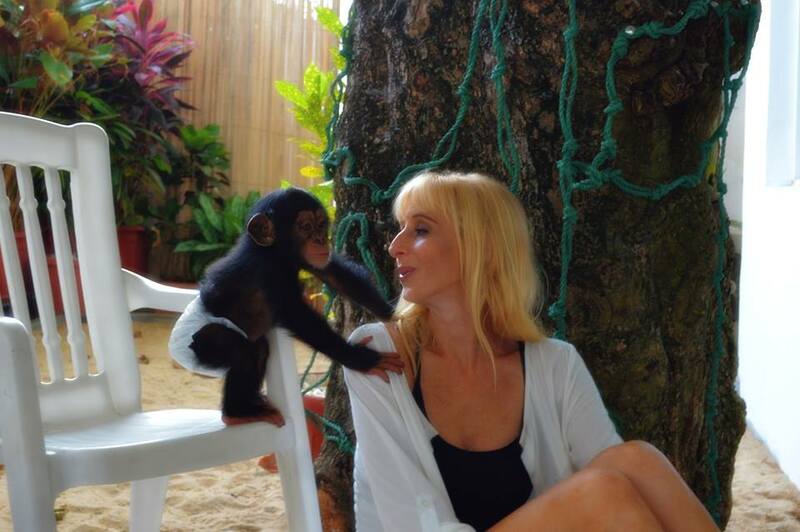 Read our story of this amazing chimp rescue by an amazing woman from her book, "My Bane is Missy." Gail and Missy in Liberia by the pool. Please click here.